True confessions of a theatre blogger: I found myself walking through my apartment this afternoon, proclaiming to the empty rooms, 'O Lord, he will hang upon him like a disease...God help the noble Claudio! if he have caught the Benedick, it will cost him a thousand pound ere he be cured.' It's one of Beatrice's first jests in the play, one that sets the tone for the evening to come. I'm not sure why exactly it was fixed in my brain with all the force of a particularly good Rick Rolling, but there it is. I love Much Ado About Nothing and have done so for years and years. It's a love that I share with a good many people- evidenced by the fact that in the six years I've lived in DC, this is my third production I've seen without trying particularly hard (you can find a review of the Folger's most recent production here in the archives). With this sort of popularity, I imagine that there's a pressure for directors to come up with singular spins on Shakespeare's text. Ethan McSweeny's production for STC is no exception- he's set the play in 1930s Cuba. There's a gorgeous set design by Lee Savage, costumes to match from Clint Ramos, and music from composer and Sound Designer Stven Cahill that all do their part to surround the audience and refashion the characters into this world. McSweeny has spoken about his interest in this time and place and the ways in which placing the play in this context supports its atmosphere (you can read his thoughts here). 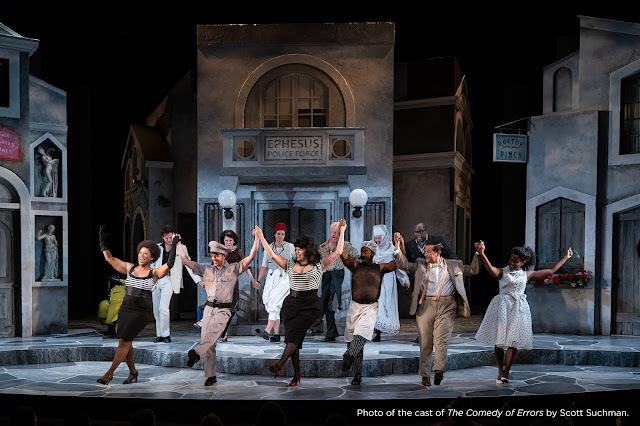 I can see the parallels that McSweeny wanted to draw between Shakespeare's Sicily and 30s Cuba; I'm afraid that I'm a bit jaded when it comes to these sort of settings and didn't really find that it added very much to the play itself. I don't deny that the Cuban setting provides some great fun in the music and the dancing (choreographed by Marcos Santana, with some standout work by Rachel Spencer Hewitt and Mark Hairston), but for me, this didn't extend as far as illuminating the story and the characters in any new way. The production does hold on to a great sense of fun, and no one is having more fun onstage than Derek Smith as Benedick. His relish for the character is evident and his enjoyment is infectious. Kathryn Meisle is an excellent match as Beatrice, and their comic skills are excellently well served by the twin gulling scenes. It's an evening with a host of clever staging moments, and some great humor. If I seem a little underwhelmed, it's perhaps that for all that this production gets right, I wish that it spent a little more time addressing some of the play's more problematic issues. Most of us tend to focus on the Beatrice/Benedick side of the play when we think of Much Ado, and forget about the more troubling aspects of the Hero/Claudio story. When I was thirteen years old and swooning over Robert Sean Leonard in Branagh's film adaptation of the play, all I wanted was a happy ending and I didn't particularly care how we got there. Mumblemumble years later, however, I'm not so anxious to rush into that happy ending, nor am I convinced that being a Shakespeare purist means that I have to because that's 'what the text says.' My favorite productions of this play in recent years have been those that showed me why I should forgive Leonato for his condemnation of Hero, and why Hero can forgive Claudio for destroying her reputation and hope of happiness in one very public swoop. I didn't see any of these moments in McSweeny's production, and I surprised at how accutely I missed them. All in all, I enjoyed many things about McSweeny's production for the Shakespeare Theatre. It was a fun night and while it reminded me of the many things that I enjoy about this play, it also reminded me of the dangers of producing this play. This was not my perfect Much Ado, but I think that it's going to be a welcome, warm respite for audiences during this winter.